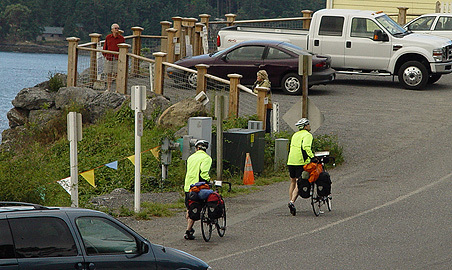 Orcas Island is popular with bicyclists arriving via Washington State Ferry and leaving their cars on the mainland. Go Northwest! photo by Dave Dean. Located on Orcas Island, established in 1988, we offer naturalist guided eco tours, with a focus on the resident orca whales, transient orca whales, minke whales, Steller sea lions, bald eagles, porpoises, harbor seals and a variety of marine sea birds. Explore this spectacular eco system, starting your trip from the center of the islands. March to November trips from Deer Harbor Marina and Rosario Resort on Orcas island. Wildlife Cycles. 350 North Beach Road, PO Box 1048, Eastsound, WA 98245. Lieber Haven Resort & Marina. 1945 Obstruction Pass Road, PO Box 127, Olga, Orcas Island, WA 98279. Phone: 360-376-2472. Orcas Island Eclipse Charters. Toll-free: 1-800-376-6566; Fax: 360-376-4780.